For a big city of over a million inhabitants, Prague is a very convenient destination for tourists. The Old Town with its cobble stone streets and medieval buildings is comfortably small, and most of its attractions are within walking distance. Vltava river and Petrin Hill offer nice alternatives to city life. And then there's the world-famous Czech beer, which is a big part of the local culture. You don't have to walk far to find a traditional pub, serving that frothy drink for a bargain. It's no wonder that the Czech consume the most beer per capita in the world, since they brew their beer well and cheap. Na zdraví! There’s normally no need for subway or a tram, if your accommodation is inside the red lines marked on the map below. Most of the attractions are located within or close to this area. The distance between the pictures numbered 6 and 4 is about three kilometers. The price-quality ratio of hotel rooms is high in Prague. There are good deals on offer at the very heart of the city, even close to Charles Bridge or in the Old Town. For more specific locations: If you enjoy shopping, Staré Mesto on the eastern side of the river would be your best choice - especially near the Old Town Square and the Wenceslas Square (both are marked on the map). Or if you prefer walking in the castle area and Petrin Hill, the area on the western side of the river, Malá Strana, is close to both. It’s also easier to find good hotel deals in Malá Strana than on the more popular eastern side. Prague Castle is not a traditional castle with defensive walls and towers. Instead, it's an area with several courtyards, small streets, churches and gardens. It also houses the office of the President of the Czech Republic. The most popular attraction in the area is the massive St Vitus Cathedral rising well above the surroundings. The size of the cathedral is clearly demonstrated in this picture, taken from the Petrin Hill Tower. There's a Royal Garden at the northern side of the Castle, also including the Queen Anne's Summer Palace (number 5 on the map). The castle and the garden are free to enter within opening hours, but for some attractions an admission fee is required. In St Vitus Cathedral, there are both free and paid areas. There are several routes up to the castle. The easiest choice is climb along the long but gradual stairs on the eastern side of the castle, starting north of the metro station Malostranska. On the map, the stairs begin south of the pictures 5 and 11. The more scenic route goes through the charming neighborhood of Malá Strana: If you’re approaching from the eastern side of the river, keep going straight after crossing Charles Bridge. Continue until the end Mostecká and then turn right to Malostranské námesti. At the end of it, turn left to Nerudova. The street makes a curve to the right towards the castle at the end of Nerudova. Petrin Hill is a large recreational area next to the city center and behind Malá Strana. There are some attractions as well as an old defensive wall, Hunger Wall, squirming in the woods. Even though most of the hill is covered with forest, the pathways are mainly paved. Exploring the area is therefore convenient by foot, if you don’t mind the constant uphills and downhills. The most popular attraction on the hill is the Petrin Tower, offering great 360° views over Prague. The stairs are rather steep, but there's usually an elevator available for an extra charge. A cafe is located at the foot of the tower. Some of the other attractions near the Petrin Tower include a planetarium/observatory, a rose garden and a small cathedral. It's easy to get to the middle of these by a funicular. The station (Újezd) at the street level is located at the crossroads of Újezd and Vítězná, at the northern side of the small park. There are several paved roads from all over Malá Strana to climb to the hill. Other attractions of Petrin Hill include a small pond on the southern area of the woods, and the Memorial to the Victims of Communism close to the funicular station. There's a historical square in the middle of the Old Town, surrounded by churches, galleries, Old Town Hall, restaurants, etc. In December, it's a venue for a Christmas Market. For views over the city, the Old Town Hall Tower is the best place. The entrance is through the tourist info center on the left-hand side of the astronomical clock. The lines can be long just after the opening, so it's a good idea to get in line a few minutes earlier. The info center opens its doors before the tower does. Astronomical clock, dating back to the 15th Century, is a popular attraction. It's located by the pictures 2 and 3 on the map, on the southern side of the building. Every hour there's a small puppet show. You can watch an example of it in YouTube here. The medieval Charles Bridge stages an impressive combination of beauty and history. Besides the perfect view over Prague Castle and Vltava River, the bridge has 30 statues, cobblestone street and towers at both ends for the tourists to enjoy. It’s a very popular destination among tourists, and you’ll find plenty of artists at the bridge selling their work all day long. In the high season, early morning is the best time to enjoy the Charles Bridge, as it’s still quiet with plenty of room to explore the statues and scenery. Outside the high season, any time of the day should be fine. Photos 3 and 4 in the gallery below were taken from the towers, Old Town Bridge Tower and Lesser Town Bridge Tower, standing tall at both ends. They are both accessible for an admission fee within opening hours. Ticket booths are located inside. You can see the entrances when standing underneath the towers on the bridge. There are several clothing stores along the street Na Příkopě, that begins at the end of the Wenceslas Square. A large shopping center, Palladium (website), is located close to the end of Na Příkopě, at Náměstí Republiky. Luxury stores and boutiques are located at Pařížská, which begins at the Old Town Square and ends to the Vltava river. The outdoor market place (Havelské tržiště) in the center can be found at Havelská. It's situated a couple of blocks from the Wenceslas Square towards the river. A popular item to purchase in Prague is Bohemia crystal. Below, there are some examples of restaurant and hotel prices in Prague. The costs of hotel rooms are median prices at Booking.com. You can compare room prices in different months and different travel agents at HotelsCombined. There are no direct metro or train lines from the Prague Airport to the Old Town. The only possibility is to take an Airport Express bus to the main train station, or a public bus to a metro stop of your choice. 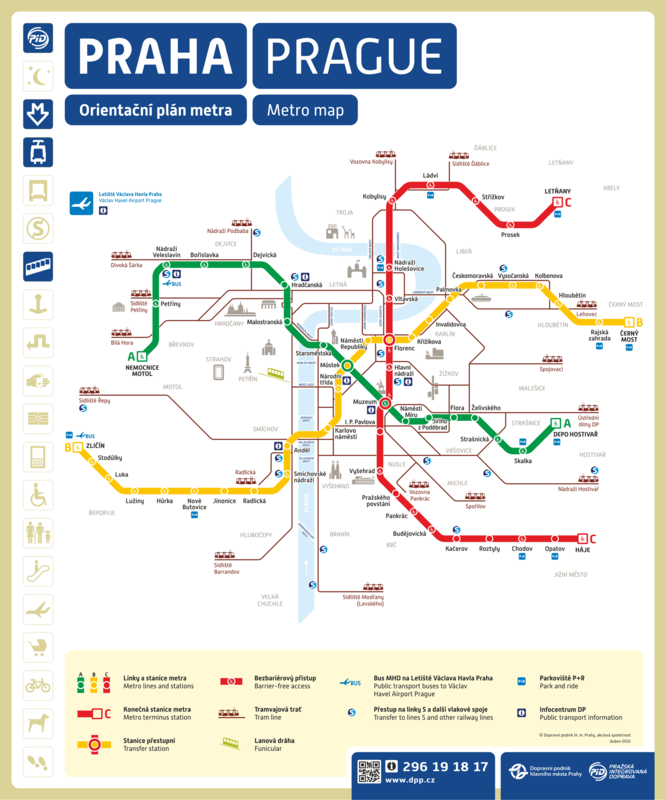 A map of the Prague metro can be found here. Bus 119: It takes you to the metro station Nádraží Veleslavín on the A line. The journey time is 17 minutes. Bus 100: It takes you to the metro station Zličín on the B line. The journey time is 18-21 minutes. Bus 191: It takes you to the metro station Anděl on the B line. The journey time is 40-51 minutes. Prague Public Transport has a journey planner on their website, where you can find the exact departure times and routes: dpp.cz. Winter: The temperature varies below and above 0°C. It can sometimes rise to 10°C during the day but just as easily drop to -10°C with some snowfall. Spring: March can still be a cold month, and the temperatures may fall below 0°C at times. In April, the weather can fluctuate from 25°C with sun to below 0°C with sleet in a few days. Anything is possible. May is already more like a summer month and there should be less surprises. Summer: Summer months are warm and sunny with temperatures climbing to over 30°C during the hottest days. However, due to occasional heavy rainfall, summer is the season with the highest amount of rainfall in Prague. Autumn: The early autumn is a good time to visit Prague, since it's still warm and the biggest tourist season is over. Towards the winter the weather starts to turn grey and occasional light rains become more frequent. By November, the night temperatures may drop below 0°C.